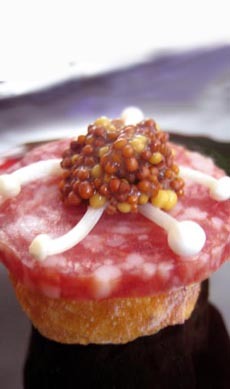 Tasty canapé: a slice of sausage atop a slice of ficelle bread, enoki mushrooms and whole grain mustard (Meaux mustard). Photo by Melody Lan | THE NIBBLE. Looking for a type of mustard? This is Page 6 of a seven-page glossary of mustard types. To visit other pages, click on the black links below. If you’d like to suggest additional words for inclusion, click here. See all of our delicious food glossaries. Often called the “king of mustards” and enjoyed by connoisseurs, this rich mustard with a slightly nutty flavor is made of roughly crushed multi-colored mustard seeds mixed with vinegar and spices. The thick and rich mustard has been used by chefs for almost 400 years in salad dressings and as coatings for meat and fish. It is traditionally packed in stone crocks. Mustard has been used as an anti-inflammatory, an appetite stimulant, a digestive aid, a diuretic, an emetic, and a laxative. 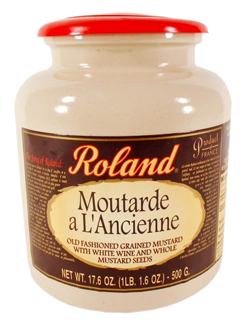 Purchase a crock of Moutarde de Meaux, the “king of mustards,” online. 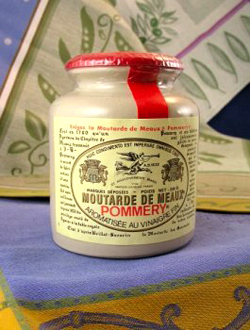 It’s made by the house of Pommery, themselves mustard-makers to the Kings of France. This Italian “fruit mustard” is actually a unique preserve made from whole fruits preserved in a sugar syrup and mustard oil—sweet fruit and tangy mustard combined. It is used like a chutney and has a sweet yet slightly spicy twist. It originated in the town of Cremona in the Lombardy region of Italy, but its origins date back to the Roman Empire as a means of preserving fruit. It is traditionally served with roasted pork, ham, boiled meats, cured pork, turkey, leg of lamb, game, cold cuts and cheese. Agrumi (citrus) goes with mild cheeses such as ricotta and mascarpone. Frutta Mista (mixed fruit: orange, lemon, tangerine, apple and pear) goes with stronger cheeses; other varieties, such as fig, are made to go with stronger cheeses; and of course accompany savory dishes as well. Here’s a longer discussion of the different types of mostarda and its history. 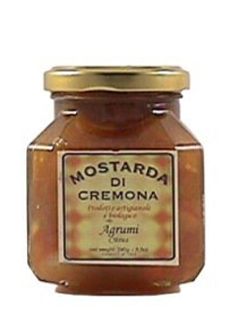 Mostarda: candied fruits in mustard. You can buy it online. “Old-style” or “old-fashioned” mustard. This grainy mustard is prepared from a base of mixed mustard seeds, verjus or white wine, spices and herbs, ground coarsely in order to leave the seeds whole. It has a dark color and a slightly milder flavor than other mustards. It has a slightly sweet taste, making it a good accompaniment for rustic foods like sausages or country-style pates and cornichons. It can be mixed with melted garlic butter and fresh thyme to create a sauce to drizzle over fish, and many other creative preparations. Also called mustard à l’ancienne, a combination of English and French. You can buy moutarde a l’ancienne online. A condiment made from the seeds of the mustard plant. All mustard is made in relatively the same way. The seeds are crushed; depending on the type of mustard being made, the hull and bran are sifted out. The seeds then may or may not go through further grinding and crushing. A cold liquid such as water, wine, vinegar, beer, or a combination is added, along with salt and spices (turmeric and cloves are often used). If it is a flavored mustard, other flavorings are added. In some cases the mustard is simmered to moderate the bite, then cooled. Some mustards are aged in large containers. 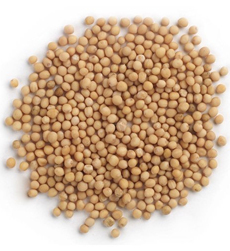 Whole mustard seeds available online. The word mustard comes from the Middle English mustarde, meaning condiment; which in turn comes from the Old French mostarde. Mosto derives from the Latin mustum, which is the word for grape must, or unfermented wine. Mustard was originally made by mixing grape juice with ground mustard seed. See moutarde à l’ancienne, above. A pungent, aromatic golden oil made from the crushed seed of the mustard plant. The oil is not actually present in the seeds. When mixed with water or other cold liquid, a chemical reaction occurs between an enzyme and a glucoside from the seeds, resulting in the production of the oil, allyl isothiocyanate. A little goes a long way: mustard oil can be mixed with vegetable oils to deliver its spicy flavor. The oil goes rancid quickly and should be refrigerated after opening. You can buy mustard oil online. Or, you can flavor vegetable oil with dry mustard. There are more than forty different varieties of mustard plants, but three produce the seeds that are used to make the mustard condiment. Brassica juncea, which originated in the Himalayans and has been cultivated for more than 3,000 years in India, is the basis for most mustards found in the U.S. and for the Chinese mustard used in the U.S. Sinapis alba, (alba means white) originated in the Mediterranean basin and has light tan seeds, which produce the mildest mustard. These are used to make American or ballpark mustard. Brassica nigra, which originated in the Middle East and Asia Minor and is popular in those areas, has black seeds, which produce the hottest mustard. All three varieties have become naturalized to North America: since mustard grows wild and weed-like in addition to being cultivated, all three can be found in nearly every state of the U.S. as well as many provinces of southern Canada. 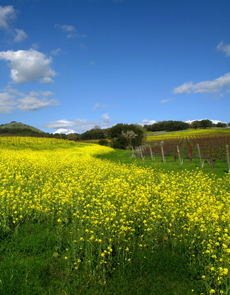 A field of wild mustard. Photo by Eveyree Sharon Kain, courtesy Napa Valley Mustard Festival. Dark and white varieties of mustard seed cannot be substituted for each other in recipes as their flavors are distinctly different. The chemical compound that combines with sinigrin to create the heat in mustard when the seeds are cracked and mixed with a cold liquid (water, vinegar, wine, beer or a combination). The chemical reaction produces mustard oil, which can actually cause burning when it comes into contact with the skin. LOVE FOOD? LOOK AT ALL OF OUR FOOD GLOSSARIES. THEY’RE A GOLD MINE OF INFORMATION!